All this talk of the Lennon/McCartney partnership has me listening to solo McCartney again. 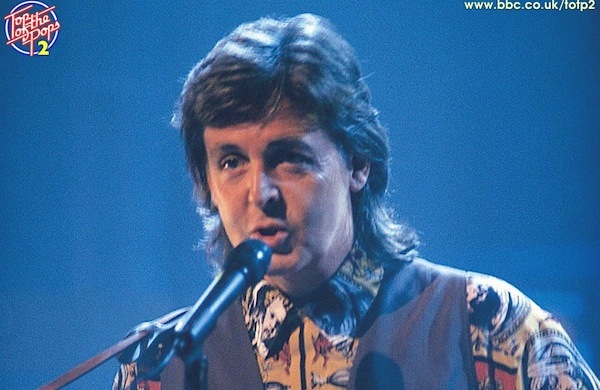 You know, to stack it up against Lennon’s stuff… And I’m curiously drawn to Paul’s late 80s/early 90s period, when he was sporting that awful mullet and the very un-rocknroll tshirt-and-vest look. After the massively underrated McCartney II, and apart from a couple songs from Tug of War, plus the obvious dual exceptions of “No More Lonely Nights” and “Say Say Say,” the 80s were pretty much a wash for Macca; not even Spies Like Us could save him… Our hero found himself at sea, in desperate need of some fresh input (not to mention some edge), a “word from the outside” as they say, which he received, thank god, from one Declan McManus aka Elvis Costello. Their four joint compositions were the out-and-out highlights of 1989’s “comeback album” Flowers in the Dirt. “My Brave Face” cracked the charts and Costello’s version of their “Veronica” remains the biggest hit he’s ever had. When two more of their songs surfaced on 1993’s Off The Ground, the stellar “Mistress and Maid” and the near-harrowing “The Lovers That Never Were,” they were so good that they cast a pall on the rest of that rather embarrassing record. Don't you like the fellow juggling the fire sticks?